Over the past few years we have lived in our first house we have slowly revamped the house adding our own stamp to each room. One room that has changed the most over the two years, is our bathroom. Although the bathroom has had the biggest makeover in the house, we haven’t actually spent or done that much to it. 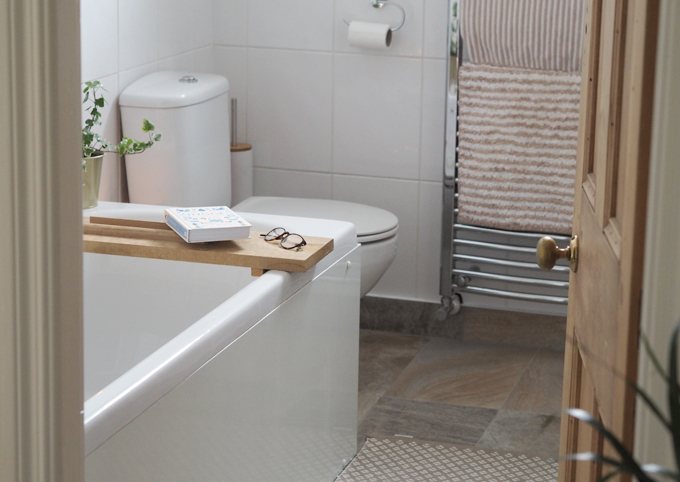 The bath, toilet and sink were all in good condition when we moved in, the room just needed a good revamp to make it feel like our own. With just a few key changes over the years the room started to feel completely different. 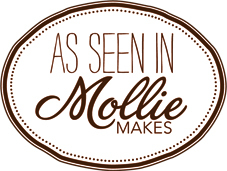 We have slowly added extras to make it feel new again, all whilst sticking to a budget. 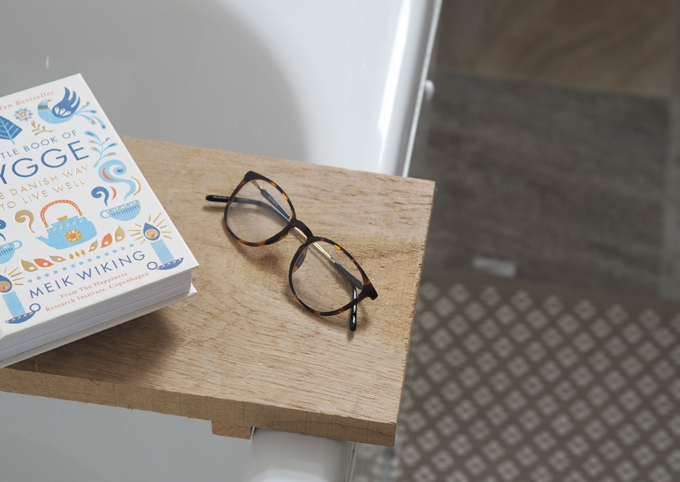 The first thing we did when we moved in was to add small personal touches to make the bathroom feel like our own. The suite was in fairly good condition apart from a few cracks and glitches. We figured we could live with them for a while so focused on buying the essentials such as new towels and soap dispensers to make the room feel more homely. By co-coordinating small accessories like these you can really bring a room together and start building a theme. 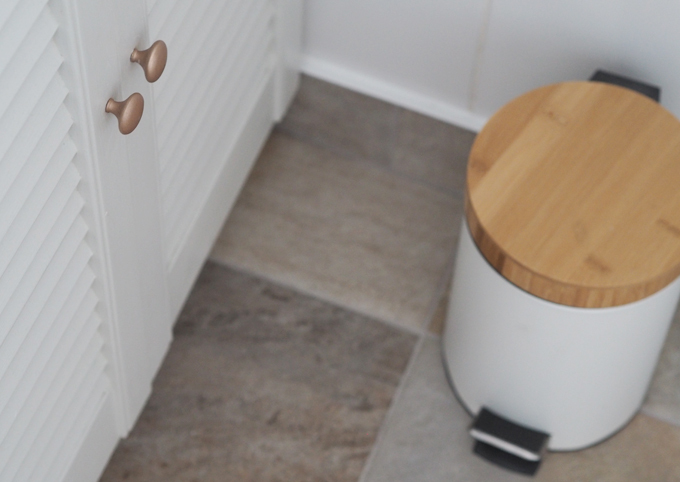 I went for plain white accessories to match the existing white tiles with a hint of light wood to match the interior doors and cupboards at the time. I found a matching bin and loo brush holder in Matalan to go with the soap dispenser and toothbrush holder from Dunelm. I then added texture and comfort with new towels and a small woven rug in similar light neutral tones to pull everything together. 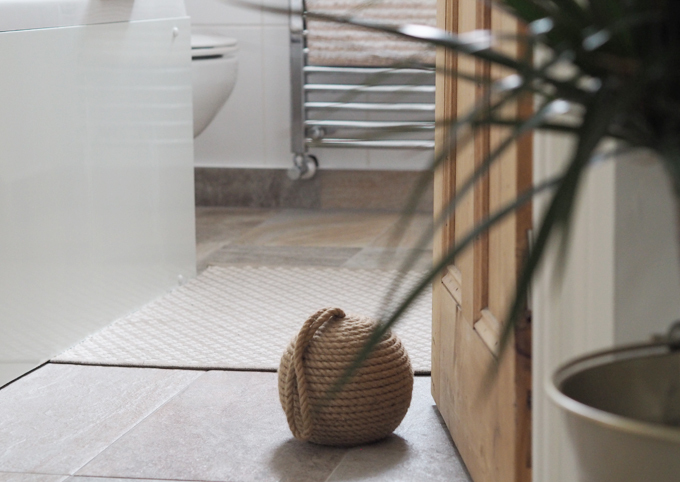 Smaller accessories such as a wicker storage basket and DIY wooden bath tray add personality to the room and add warmth to the bright white bathroom suite. I also love adding plants around the house, including the bathroom. 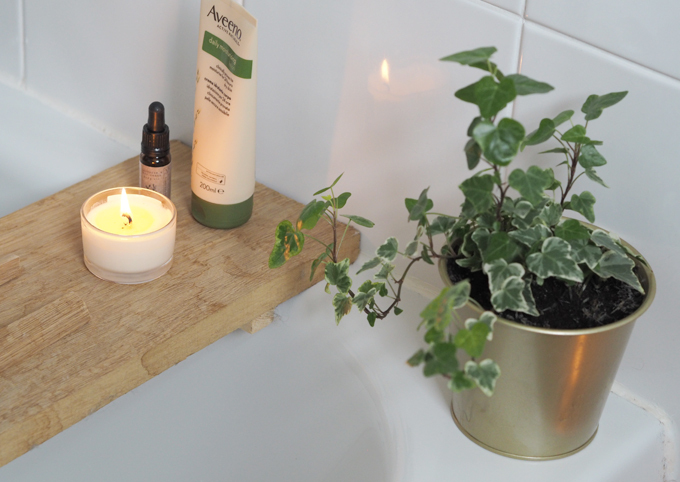 I’ve found plants such as ivy thrive in warm, humid environments such as bathrooms and add a hint of colour against the clean, minimalist suite. The next thing we did was slowly save up to replace older, damaged areas of the bathroom with new ones. 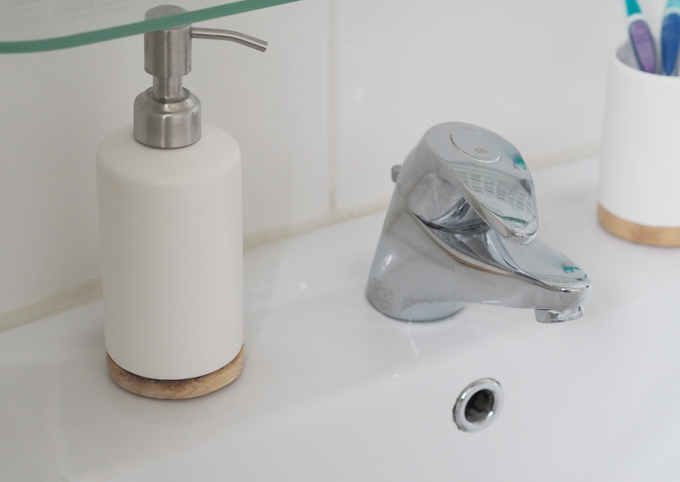 These changes might have cost the most but have made the world of difference to our bathroom. Replacing the floor tiles was one of the biggest DIY jobs we have done in the house, but totally worth it, I love the finished result. I chose a stone effect in neutral and grey tones to reflect the minimal theme and keep the room feeling light and bright. Changes like this can help make the whole room feel new even if it isn’t. We have also recently changed the showerhead and casing which has made a big difference. The old plastic casing on the shower above the bath had a yellow tint to it when we moved in, not pretty compared to the bright white bathroom suite. So instead of replacing the whole shower unit I bought a new exterior case and showerhead in a fresh white to fit in with the rest of the room. This cost a fraction of the price and along with some rubber gloves and a little scrubbing the shower now looks good as new. My favourite recent replacement is the new mirror we have put up in place of the old one that was there when we moved in. The old one was a simple glass circle secured by two screws. The new one only had a picture hook holder, so I had to do a bit of DIY using ‘No More Nails’ on the picture hook to hang it in the same place. 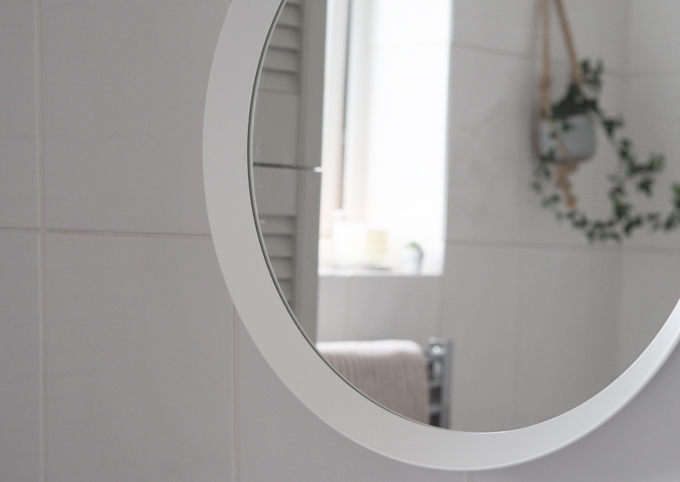 I chose a more modern shaped mirror from Ikea, with a simple white rim to fit in with the rest of the room. 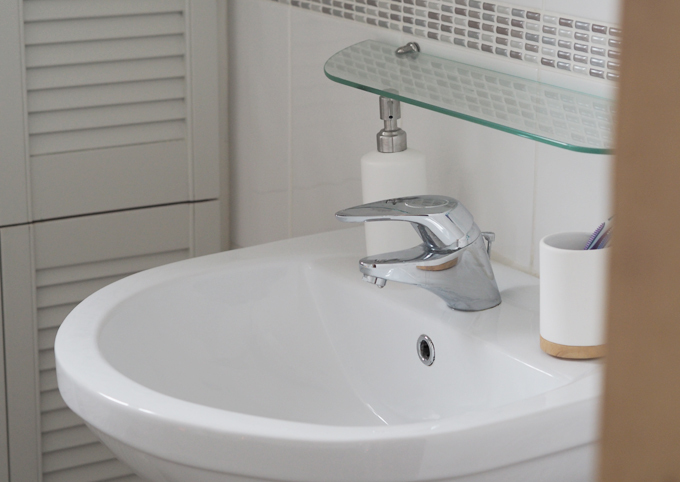 Applying a fresh coat of paint or adding a splash of colour is a great way to revamp a bathroom suite. Whether it’s one feature wall in a matte grey or all white cabinets, using paint can be a really quick and inexpensive way to refresh a room. 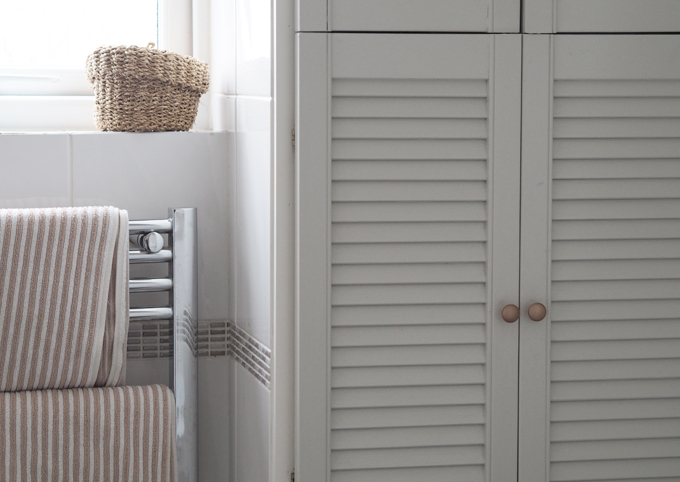 You might have seen my blog post last year all about my bathroom cabinate makeover, where I painted over the natural wood cabinets with a fresh coat of paint. 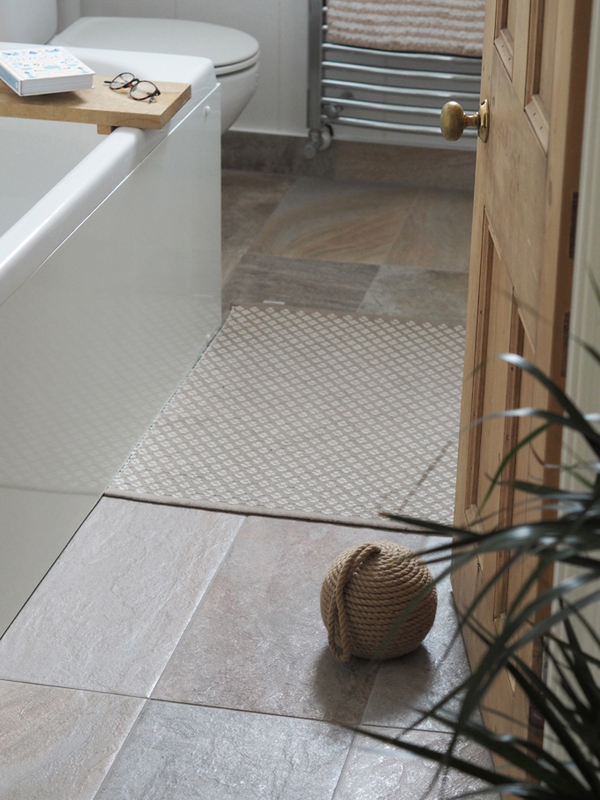 This transformed the bathroom, making it feel light, bright and opening up the small space. I think the the pale grey paint makes the cabinets look a lot more contemporary compared to the old bare wooden doors. The paint only cost around £30 yet helps bring the room to life. I am super happy with how our bathroom is looking at the moment, we have really put our own mark on it whilst still sticking to budget. 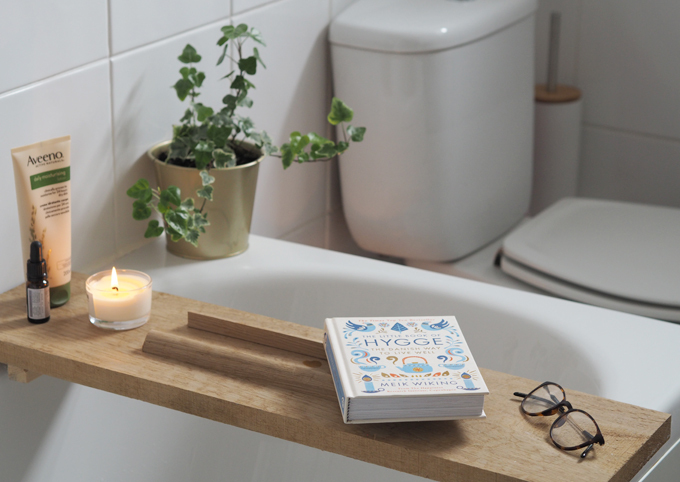 Proving you don’t have to spend a fortune to give your bathroom a makeover. 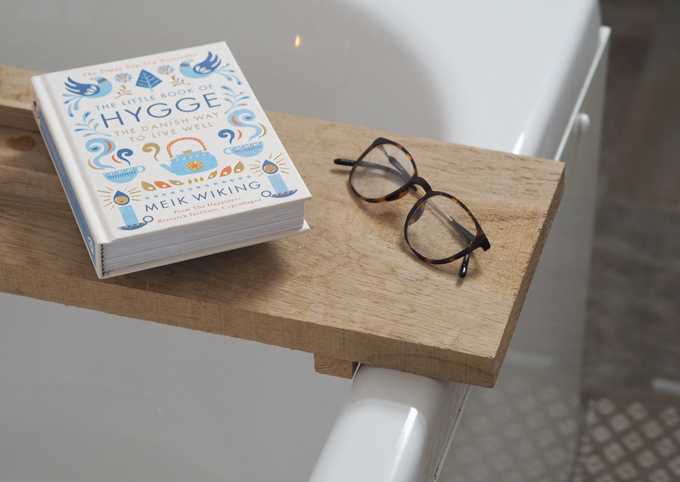 See how I made the bath tray featured in this post here. 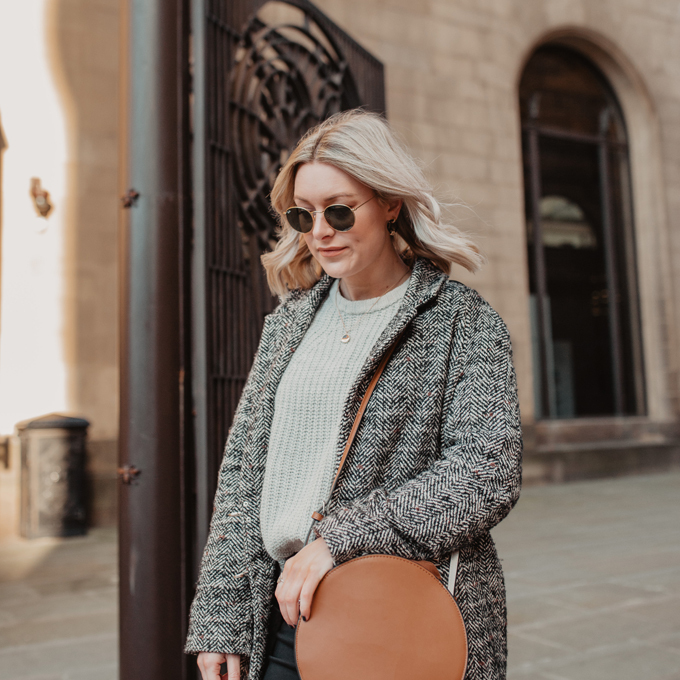 This post was sponsored by Harrogate Bathrooms. 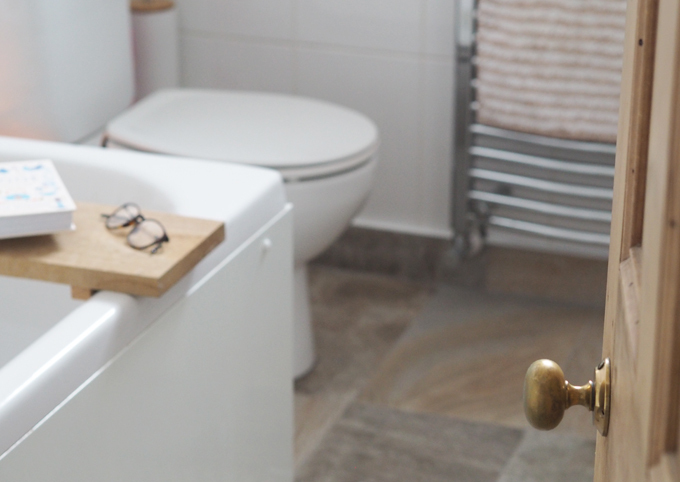 I hope you have enjoyed this post, if you want to read more about giving your bathroom a makeover or for simplistic, yet classy design inspirations visit Harrogate Bathrooms to revamp your wetrooms. Thanks for sharing the guide your tips are very helpful. All the things are looking perfect on there place very beautiful arrangements.